(Newser) – Disney has received a patent to take pictures of visitors' feet at its theme parks, the Los Angeles Times reports. 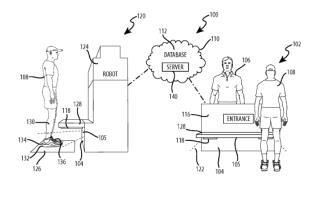 Specifically, the patent titled System and method using foot recognition to create a customized guest experience would scan guests shoes when they enter the park then track them as the move about. According to the Orlando Business Journal, this would allow Disney to track guests' favorite rides and paths through the park. It could also allow them to have Donald Duck greet guests by name or get souvenir photos or videos to them more quickly. The scanners could discern everything from shoe color, to wear patterns, to gum stuck on the sole. Disney filed for the patent back in 2015; it was issued by the US Patent & Trademark Office on July 19. Since they don't have any plans to actually "use" the foot patent, according to the article, why they even get one?? Sometimes, I really don't understand people a whole lot!